In this May 9, 2013, file photo, a worker pushes shopping carts in front of a Walmart store in La Habra, Calif.
A new lawsuit contends Walmart's self-checkout kiosks aren't fully accessible to blind customers and therefore violate the Americans with Disabilities Act. Three blind Maryland residents and the National Federation of the Blind filed the lawsuit in federal court Oct. 25, The Baltimore Sun reports. The lawsuit also says an employee at an Owings Mills location selected cash back from a plaintiff's debit card and took $40 without her knowledge. The plaintiffs seek a permanent injunction that would bring the self-service kiosks in line with accessibility regulations, a declaration that Walmart has been violating the ADA, court costs and attorneys' fees. 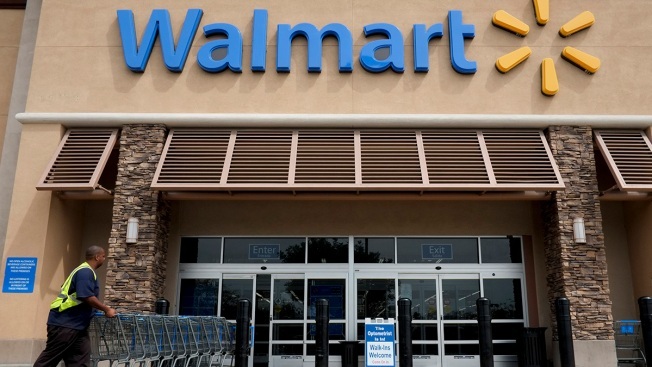 The lawsuit says the federation tried to work with Walmart to address problems before suing. Walmart representatives didn't return the newspaper's requests for comment.